MCSA and its campuses will be interviewing applicants for part-time teaching positions as they become available. All part-time teachers (PTT) are paid $22.43 an hour (w/ Bachelor’s Degree). Instruction hours vary by campus. Applicants must produce documents of citizenship or legal work status, tuberculosis (TB) skin test (good for 1 calendar year), and official college transcripts upon hiring. Background check (finger printing) also required for all new DOE employees. 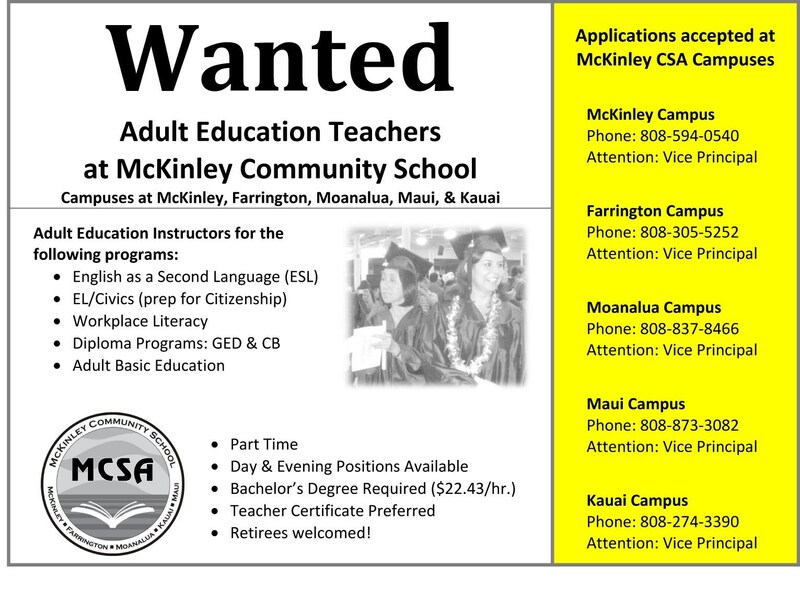 If you are interested in applying for a part-time teaching position, please email an application and copy of your resume to resume@mcsahawaii.org . Applicants will be called for interviews as vacancies become available.